What you'll often see is that pen enthousiasts will lean towards buying an M800 or M1000 instead of opting for the slightly smaller M600. However, as one of those collectors who bought an M800, I have to say -or rather admit- that the M600 is actually the superior pen. I'll do an in-depth comparison of the different Souverän models later on, but for now: let's focus on why the M600 is so great! First of all: the size. In my review of the M800, I mentioned it being slightly oversized. The M600, on the other hand, is perfectly sized for everyday use! The size is- what I would consider- the perfect balance between compact (not as in-your-face as the M800 and M1000!) and comfortable to use. I don't think anyone (regardless of the size of your hands) would find this pen uncomfortable to use. Secondly: the weight, Due to the use of plastic for the Piston mechanism, they managed to keep the weight low. I found it to be perfectly balanced unposted (There's not much weight to it, so it can't really feel 'unbalanced', if that makes any sense!). 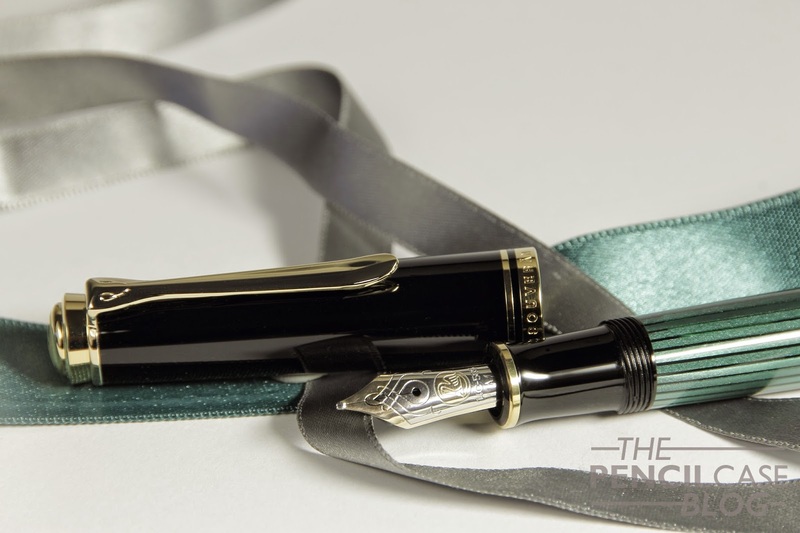 Combine the perfect balance with a comfortable girth, and you've got yourself a pen that can be used continuously without cramps or uncomfortable experiences. Build quality is really top-notch. 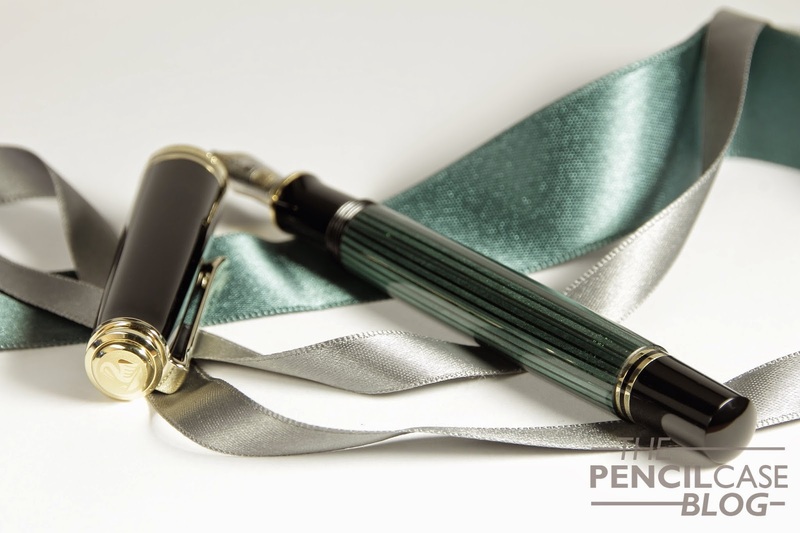 For the price, I don't except anything less than perfection, and Pelikan succeeds at delivering! There's really nothing bad to say about these pens. The green 'stresemann' striations are still gorgeous, and all parts are polished to an impeccable high-gloss finish. 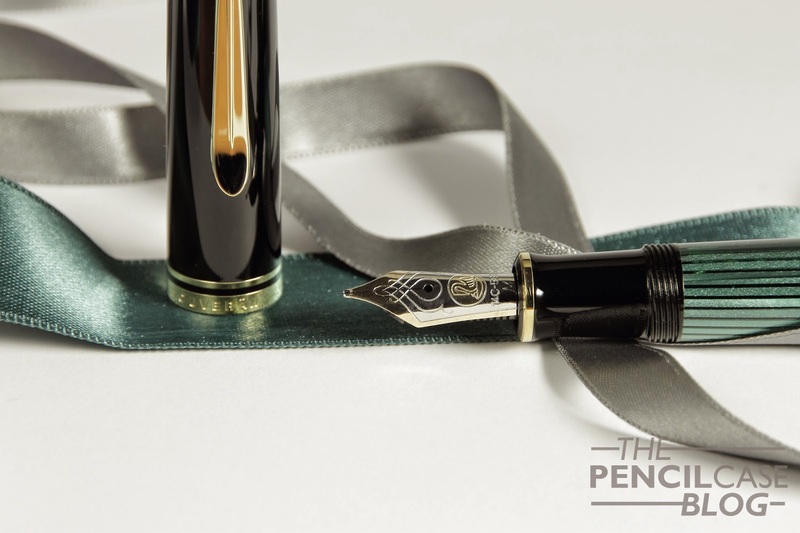 Everything fits together nice and snugly, and the piston operates smoothly (something Pelikans are known for). 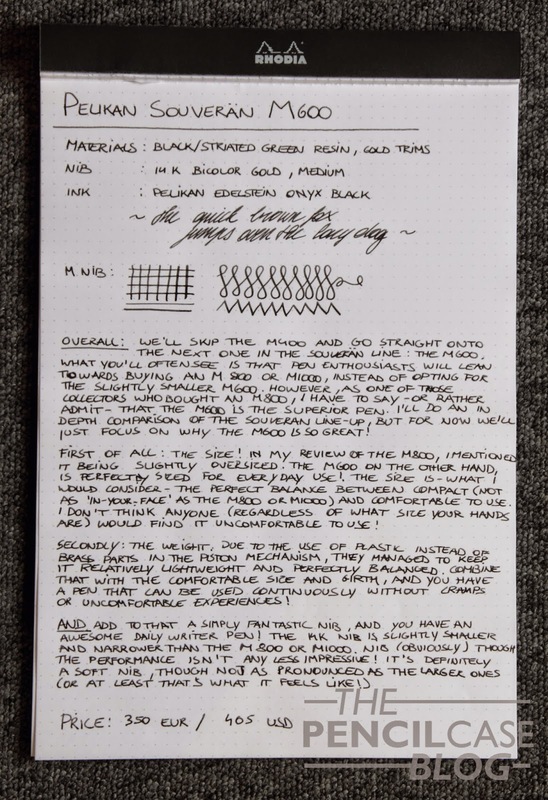 Add a simply fantastic nib (both visually as performance-wise), and you have an awesome daily user pen. A very expensive daily user, definitely not one to throw in the jeans pocket (It's not small enough to fit in your pocket anyway!) But seriously,... the nib is pretty awesome! The bi-color 14k nib is (obviously) quite a bit narrower and shorter than the one on the M800 and M1000, but it isn't any less impressive. It's easily one of the smoothest nibs you'll get, it even has a bit of softness to it, though not as pronounced as the larger ones (or at least that's what it feels like.). I'd expect a nib as smooth as this to have a lot of skipping and hard start issues, but that doesn't seem to be the case! In fact it never hesitated on me, not even once. The price is the only thing that prevents me from buying at least three, or at least right now. But I'll definitely have one of these in my collection one day. 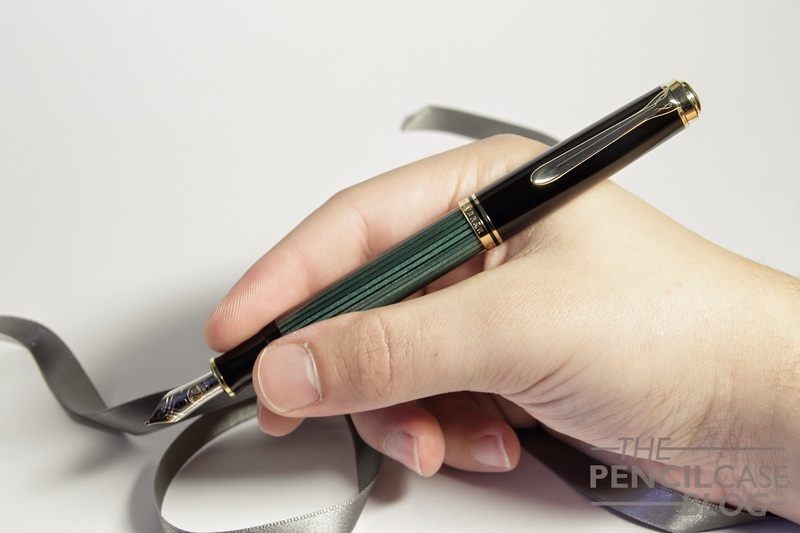 The Pelikan M600 retails for around 350 EUR / 405 USD, but it can be found cheaper in some places. Interesting to read your findings and your preference of this pen to M800. 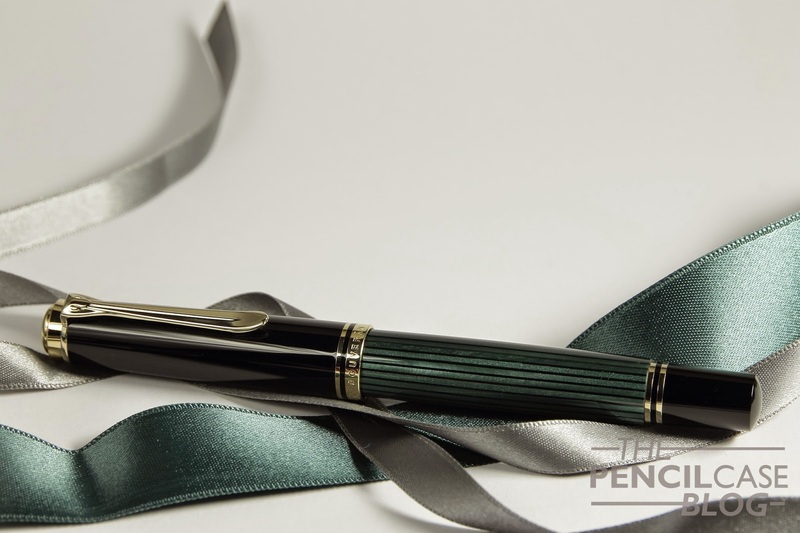 To what pen would you say this M600 compares best size-wise?